Atlantic Partnership exists to educate the public in national and international political and economic issues, including those values and ideals of good governance and constructive relations between countries, particularly but not exclusively those in the transatlantic community embracing Europe and North America. It is a non-partisan organisation and does not seek to inculcate or promote a particular point of view. 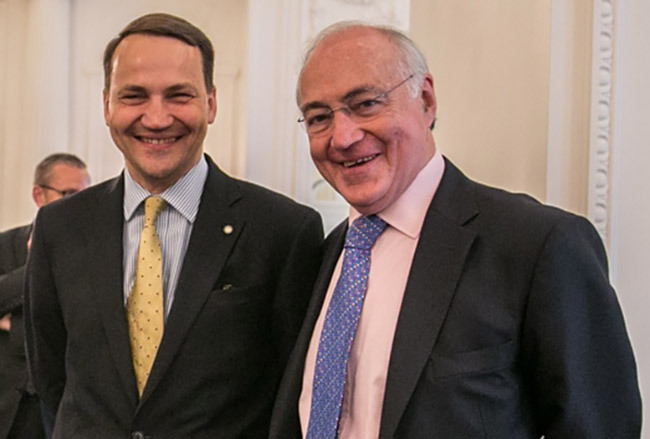 Polish Foreign Minister Radoslaw Sikorski and Atlantic Partnership President Lord Howard. Atlantic Partnership is not a membership organisation, does not charge any fees for participation in its events or remunerate its speakers. Its resources are correspondingly modest. But within them it aims to bring together diverse audiences whom it believes will benefit from the opportunity to listen and debate with its invited speakers and apply the lessons learned to their own particular challenges in the broad areas of public policy and international relations. Atlantic Partnership (whose registered name is the Atlantic Education Project) is a registered charity in England and Wales. It cooperates closely with its sister organisation, Friends of Atlantic Partnership Inc, an American not-for-profit (501/C/3) organisation, exchanging information and passing on experiences, while retaining its independence and separate governance. Atlantic Partnership was first established in the UK in 2001 and recently celebrated its first decade. Its Chairman in the UK is Lord Powell. The Chairman of Friends of Atlantic Partnership Inc is J.R.Drexel IV. More details under Who We Are.